The Greater Mekong Subregion Rehabilitation of the Railway in Cambodia Project: Environmental Monitoring Report No.9 can now be accessed from the ADB website. According to the report, as of November 2011, the Southern Line was 51.9% complete, while the Northern Line was just 3% complete. The “missing link” between Sisophone and Poipet was 35.4% complete. The report also notes TSO’s environmental report for November 2011 had not been submitted due termination of TSO’s QE manager. It further discusses the inadequate housing and sanitary conditions of some of the construction workers along the tracks, in particular Kampot station where the situation amounts to a “very high” health risk. TSO is also accused of not providing its staff adequate safety tools. Australian logistics company Toll Group is allegedly pulling out of its 30-year concession to operate the Kingdom’s national railway, according to the Sydney Morning Herald. 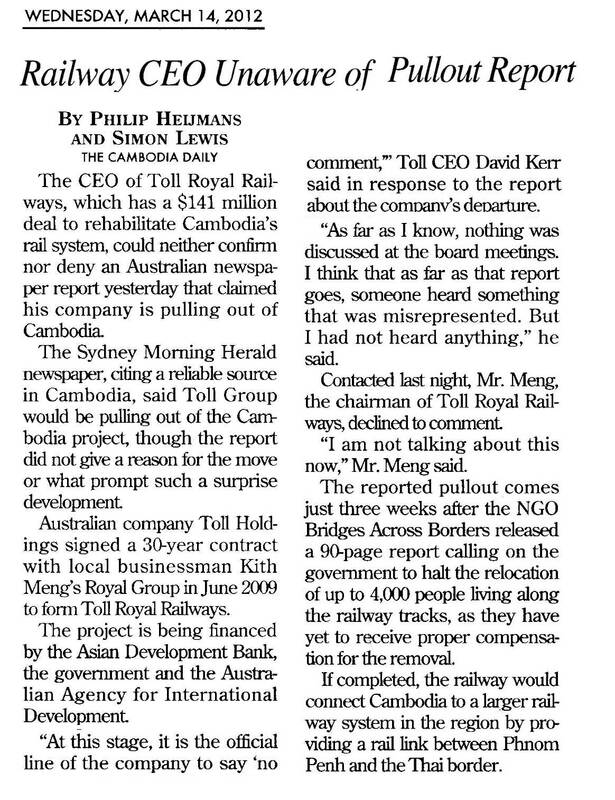 Citing “reliable sources”, an SMH report said Toll would leave its US$145 million Toll Royal Railway joint venture with Cambodia’s Royal Group of Companies. No reason was given for the decision, and a Toll Group spokesman declined to comment for the article. The Post last month contacted a number of the partners involved in the project amid speculation that Toll Group was frustrated with the pace of the rail’s redevelopment and had decided to leave Cambodia. Officials denied any such claims. Royal Group’s Kith Meng rejected the allegations when reached by phone in late February, and he declined to comment when asked again yesterday about the project. A Cambodian government spokesman in February said he had no knowledge of Toll’s alleged plans to pull out, and reiterated those claims yesterday. A Toll spokesman in Melbourne repeatedly denied having knowledge of the matter, although a separate official based in Singapore said the company was working on a statement in conjunction with the Cambodian government as to the status of the project. Toll Royal officials yesterday again declined to comment, saying a statement from the parent company was expected later this week or next week. AUSTRALIAN company Toll Group is set to pull out of a controversial $145 million project to rebuild Cambodia’s railways, reliable sources in Cambodia say. Under an agreement signed in 2009, Toll and a Cambodian joint venture partner were to operate the railways for 30 years. The project, partly funded by the Australian aid agency AusAid, has been at the centre of claims that up to 4000 people living along the tracks are not being fully compensated for having to move. A Toll spokesman declined to comment. The rebuilding of two decrepit rail lines linking the capital, Phnom Penh, with a southern port and with the Thai border in the west is strategically important. They were seen as part of a planned inter-country rail network linking Singapore and China through Thailand, Malaysia and Vietnam. The Toll Group had a 30-year contract in a joint venture with well-connected Cambodian businessman Kith Meng through his Royal Group of companies. In November last year, Fairfax Media reported that a 13-year-old girl and her nine year-old brother drowned in a deep pool four days after their family was uprooted from their home and moved to a resettlement site so work could begin on the railway.